Senior night at Eastlake High School is always bittersweet as the home fans celebrate the players they have cheered on for many years. For the 24 seniors taking the field for the last time, this night was even more poignant with no playoffs on the horizon. The Wolves hosted out-of-conference opponent the Lynden Lions who brought a 4-4 record 3 hours south to take on the Wolves. Although Lynden is a small school, there is nothing small about their football team who featured players like 6'4" 205 lb quarterback James Marsh and 6'8", 230 lb lineman Trey LaBounty. For a quarter, the feisty Lions looked like they would give the Wolves a football game, scoring on their first drive to take a 7-0 lead and putting together another strong drive the second time they took the football. But once the Wolves got warmed up, they showed Lynden what it means to play KingCo 4A football, rolling to a 42-7 victory. The game started well for Lynden when they forced a 3-and-out on Eastlake's first possession and quickly strung together a long touchdown drive. Quarterback Marsh scrambled for 11 yards before hitting a bubble screen for 2 more. Marsh then hit Kobe Eisner with a swing pass for a 22 yard gain and the Wolves were on their heels. Lynden was controlling the line of scrimmage, showing a nice mix of Marsh passing and interior running. With 5 minutes to go in the first quarter, Eric Martin-Mann capped the drive with a 14 yard touchdown run right in the heart of the Eastlake defense. Lynden 7, Eastlake 0. A fired up Lynden defense force another Eastlake 3 and out when they sacked Connor Brown on 3rd and 6. Brown punted the ball away but Lynden muffed the punt and Eastlake's Jaxon Williams picked up the ball in stride and headed toward the end zone before being tripped up at the Lynden 26. With a second chance, Brown found his rhythm, eluding a blitz and throwing a laser to Hank Pladson for 15 yards. Two plays later, Brown again evaded the rush and found Nate Sutter for an 11 yard Eastlake touchdown. Kicker Jack Matheson continued his all-KingCo caliber season, hitting the PAT to tie the game at 7-7. 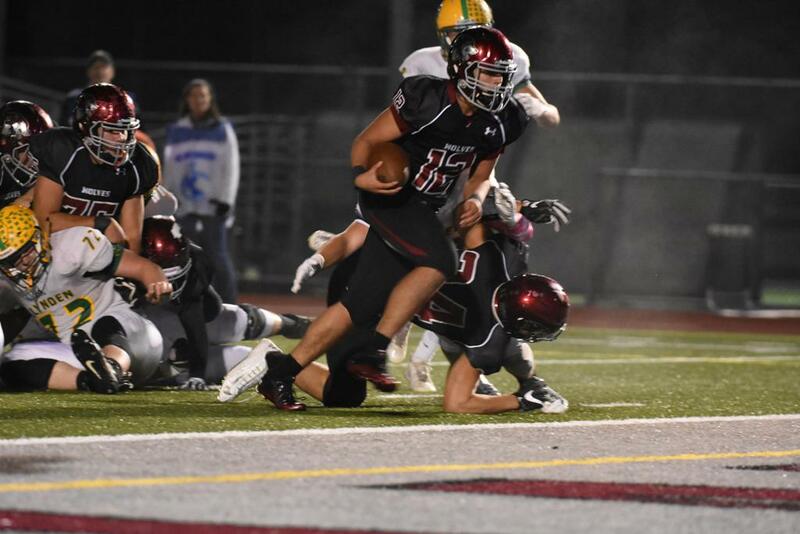 After senior Eric Baisler tackled the Lions kick returner on the ensuing kickoff, quarterback Marsh went back to work, showing a strong, accurate arm on a series of slant passes in front of the Eastlake defenders. With the Lions about to score from the Eastlake 3 yard line, Marsh went to one slant too many. Eastlake senior safety Pladson stepped in front of Marsh's pass and returned it 100 yards for an Eastlake touchdown. Matheson converted and Eastlake suddenly led 14-7 early in the 2nd quarter. Eastlake senior Jack Henderson stepped up on the next kickoff, knocking the returner out of bounds at the 26. Martin-Mann continued to hammer the Eastlake defense, ripping off repeated runs of 8-plus yards. 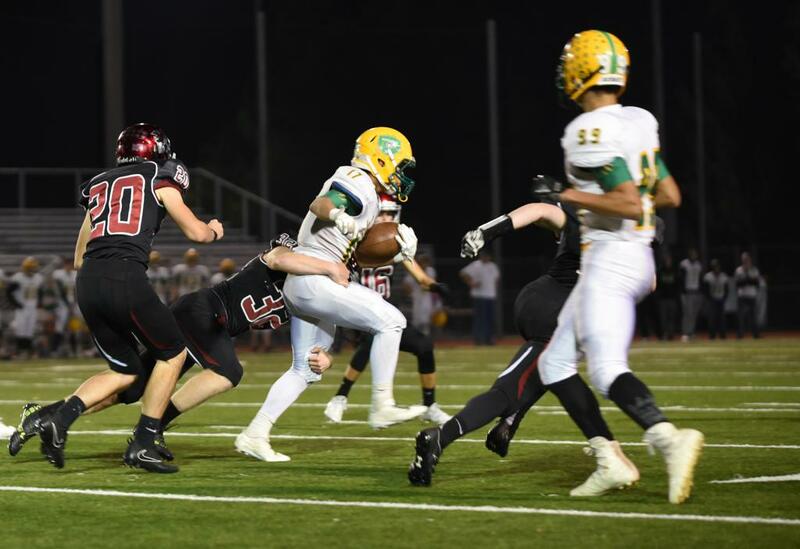 However, a Lynden delay of game brought up 3rd and 9 and on the next snap, linebackers Reed Payne and Jack Hart stuffed Martin-Mann, forcing a Lynden punt. Eastlake took the ball and after Brown hit Pladson for 9 yards, he threw another laser, this time to junior Dalton Chandler that went for 67 yards and appeared to be an Eastlake touchdown. Unfortunately, a personal foul on Eastlake brought he ball all the back to midfield and after Brown took consecutive sacks, Eastlake punted away. At this point in the game, the Wolves defense started to assert themselves with Brody Leslie and Sam Marks combining to sack Marsh, setting up a 3rd and 12. On Marsh's next pass, a monster hit by Hart jarred the ball loose and forced a Lynden punt. With less than 2 minutes left in the half, Eastlake took possession near midfield. After a holding call set up first and 20, Brown hit Pladson for 11 yards, then connected with Chandler for 15 more. With 27 seconds left in the half on the 31, Brown found his favorite target, Pladson, down the right sideline for a 31 yard touchdown. Matheson converted and the Wolves extended their lead to 21-7. Lynden rallied with 20 seconds on the clock, driving to the Eastlake 35 but a 52 yard field goal try was well short of the game and the half ended, 21-7 Eastlake. After the Eastlake band rocked a couple of Queen classics at halftime ("Crazy little thing called love" and "Bohemian Rhapsody"), the teams returned for the second half. 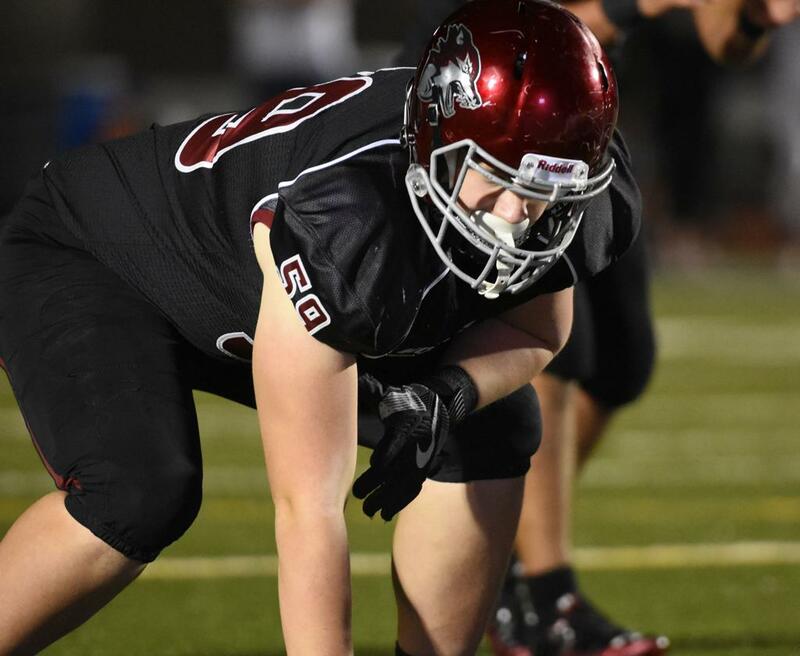 While the Lions continued to scrap and battle, Eastlake was simply the better team. On Lynden's first possession, the Wolves forced a 3-and-out and a shanked punt gave Eastlake the ball near midfield. Running a 2-back set for the first time, Jack Hart and Chris Nelson alternated carries and the ground-and-pound game move the ball to the 35. Brown once again dialed up Pladson, hitting him for an apparent 35 yard touchdown. However, Pladson was ruled out-of-bounds at the 1-yard line which gave Hart the opportunity to punch in the score and extend the lead to 28-7 midway through the 3rd quarter. Like the ghoul in a Halloween horror move, the Lynden Lions came right back to life, steadily marching their next drive to the Eastlake 26. However, trailing by 21 and facing a 4th and 5, Lynden went for the first down but Jaxen Williams was having none of it, providing safety help on a pass to the end zone and forcing a turnover on downs back to the Wolves. Brown went back to work, finding Hunter Klinge on a short pass. Klinge put on two great moves, eluding tacklers and taking the ball to midfield. However Brown's next pass sailed long and was intercepted by Lynden and returned to the Eastlake 40. 3 plays later, Nelson, playing cornerback, bailed out is senior quarterback with an interception of his own, giving the ball back to Brown and the offense. After Hart ran for 12 yards behind a great downfield block by Sutter, Brown found Pladson open for 40 yards down the seam. A Brown-to-Jaxen Williams pass netted another 15 and then Brown went back to Pladson for a 5-yard touchdown pass. Matheson was perfect yet again the Eastlake's lead was 35-7 with 9 minutes left in the game. While Lynden continued to battle, they just couldn't find sustained momentum against a fired-up Eastlake defense. After an unsuccessful fake punt attempt gave the ball back to Eastlake, Brown drove the Wolves down the field one final time. Brown found Payne for a 9 yard gain before consecutive runs from Nelson and a Brown keeper tacked on 23 more. With the ball inside the 10 yard line, Brown gave the offense over to senior Michael Puttick who took over at quarterback. Running behind fellow senior Nick Villegas and sophomore Jake O'Donnell, Puttick ran in for the final Eastlake touchdown of the night (Eastlake 42, Lynden 7). 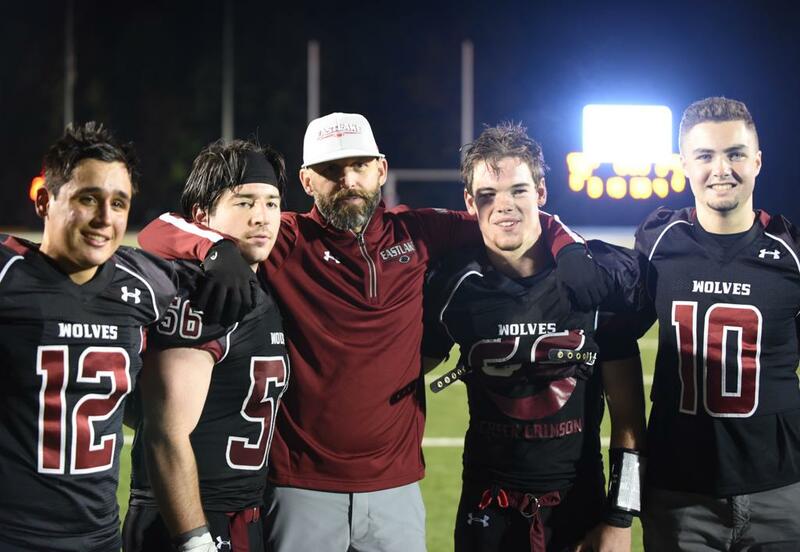 While the game was effectively over, the Wolves got one more highlight when junior Hunter Synder intercepted Lynden's last gasp pass attempt, snuffing out the Lions final drive and sealing the victory. As the clock ran out, the Wolves had a lot to celebrate. The team posted a 6-3 season record (5-3) in conference, knowing they were "this close" to a playoff run. Pladson re-wrote the record book, establishing a career touchdown record that will stand for many years. Beyond the statistics, he set the standard for savvy and toughness on both sides of the ball. Brown put together a statistically outstanding senior season and was another proof point that you could stamp your name in the school record book as a one-year starting quarterback. Running back Chris Nelson, the 3rd of three brothers to suit up for the Wolves, battled injuries but finished his career strong. 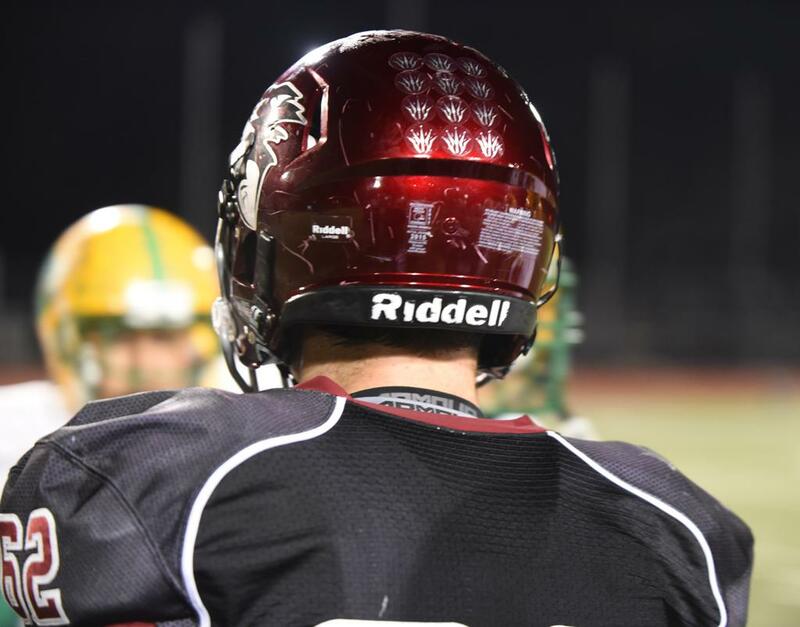 Linebackers Jack Hart and Sam Milton will be remembered for their "guts and glue" toughness that is the hallmark of Eastlake's often undersized linebackers. Jack Matheson was the best kicker Eastlake has had in years and Williams, Payne, Spencer Thompson, Connor Doran and the rest of the seniors have all left their footprint in the sand of Eastlake football. Tremendous Thank You to Simon Puttick, Chad Greene, Jeff Steinbok, Rob Veal and George Bickel for all their work on the sidelines taking photos at games all season long!